The Annapurna circuit trek entices trekkers with dramatic mountain views, glaciers and some of the world’s highest peaks. The Annapurna circuit trek is a great introduction to Himalayan trekking, as it can be completed in just over two weeks, the altitude reached is challenging 5,420m/ 17,782 feet, and the trails along the way are good, trekking over one of the highest trekking pass in the world. 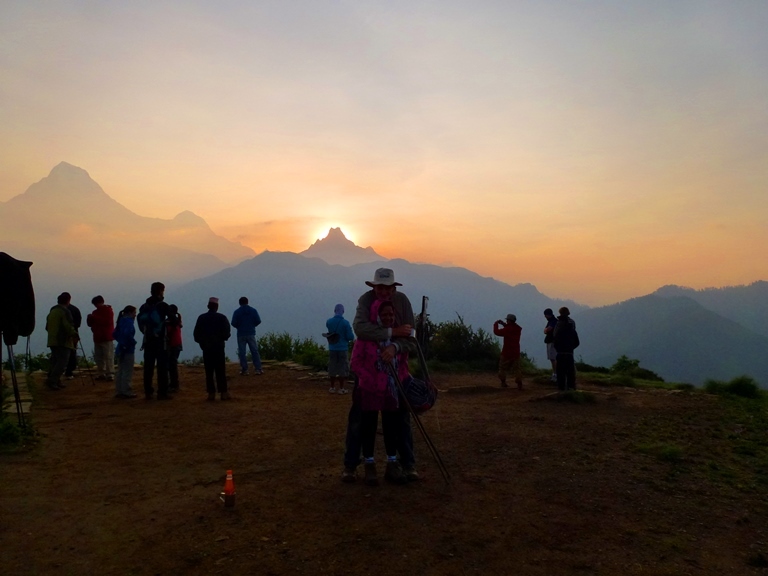 We have the itinerary designed to give you the best chance of completing your goal and enjoying the journey, with a steady rate of acclimatization and the opportunity to enjoy the beautiful views of the surrounding mountains. The Annapurna circuit includes Annapurna, Manaslu, Dhaulagiri range, fascinating landscapes of Mustang, Muktinath Temple, Braga village, numerous monasteries and the Kaligandaki gorge. 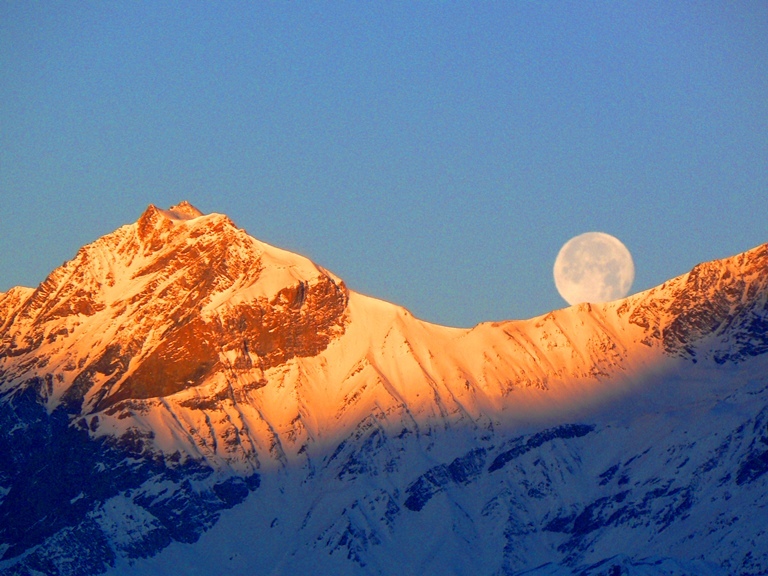 Completing the Annapurna Circuit trek is one trek not to be missed! Our Annapurna Circuit Trek starts in Kathmandu. You will be met at the airport and brought to our hotel base in Thamel. We will have a briefing, dinner, gear check and make sure you are ready for the trek. 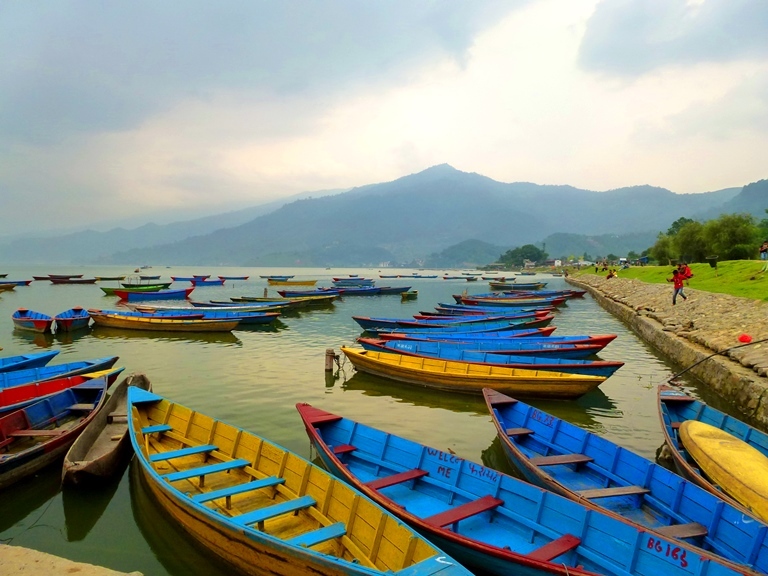 You can pick up some last minute items in Kathmandu or wait for Pokhara. This morning we will drive to Syange 1,100m/ 3,609 feet – Driving time: 7 to 8 hours. The mountain scenery along the drive is magnificent. We will stop for lunch on route. Overnight stay at a lodge. Syange to Baggarchhap 2,160m/ 7,087 feet – Hiking time: 6 to 7 hours. 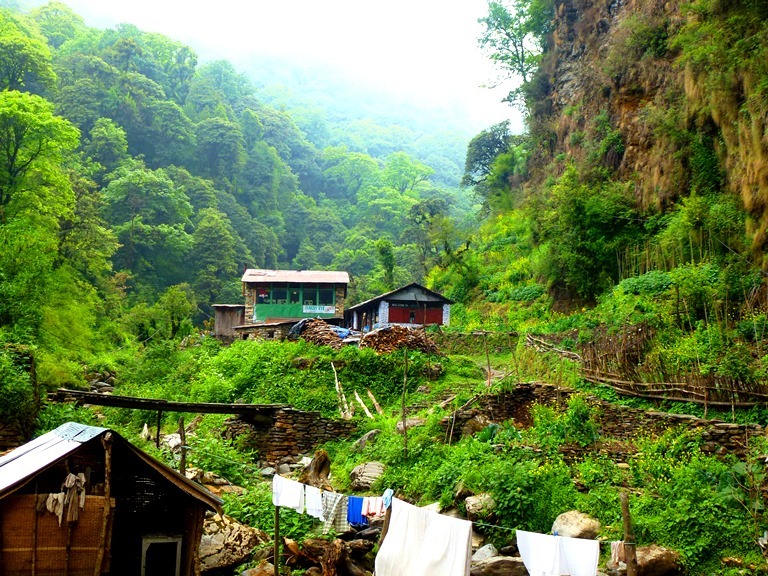 From Syange, it is an easy trek north through the Marshyangdi Valley. 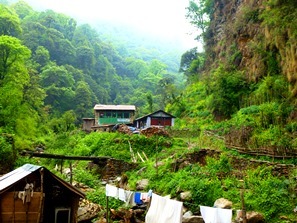 The trail follows valley through Gurung villages. The next stop will be for lunch in Khudi which offers fine views of snowy peaks Himalchuli and Ngadi Chuli. Overnight stay at a lodge. 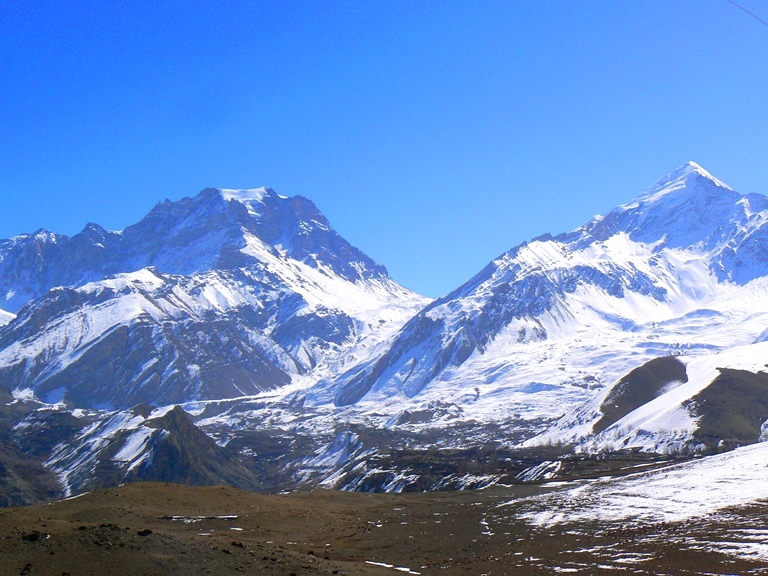 Baggarchhap to Chame 2,670m/ 8,760 feet – Hiking time: 7 to 8 hours. The trail climbs first to Lattemanang 2,440m/ 8,005 feet and advances through forest of pine and fir. Lunch at Dhukure Pokhari. Arriving in Chame you are greeted by a large mani wall with many prayer wheels. This village is the head quarters of the Manang district, consisting of hotels, a bank, a health post and two hot springs! You can relax in the natural, hot baths before heading to sleep in your lodge. Overnight stay at a Lodge. Chame to Pisang 3,200m/ 10,499 feet – Hiking time: 6 to 7 hours. 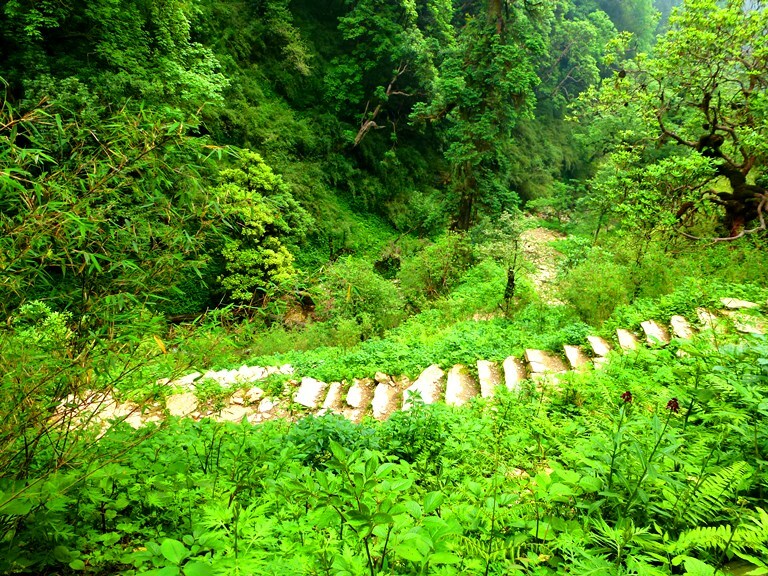 The first part of the trek runs through forest in a steep, narrow valley. There are views of the soaring Paungda Danda rock face. The path then leads through forest to the upper Manang valley, climbing to the sprawling village of Pisang. Overnight stay at a lodge. Pisang to Ngwal 3,657m/ 11,998 feet Via Ghyaru – Hiking distance: 5 to 6 hours. The northern route by Ghyaru offers beautiful views and follows the northern bank of the river. Ngwal is one of the most beautiful valleys in this region. The scenery is beautiful. Overnight stay at a lodge. Manang 3,540m/ 11,614 feet – Hiking time: 4 to 5 hours. 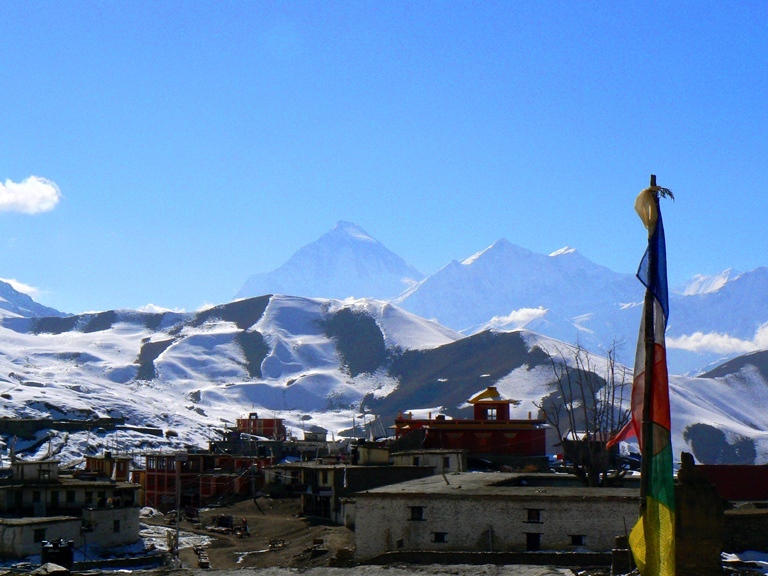 There are spectacular view points around the village, such as the Gangapurna Glacier. The Monastery has a large number of Buddha statues worth seeing. It is possible to get last minute shopping here. You can attend a high altitude talk here. It is in your best interest to allow yourself plenty of rest for the climb the following day. Overnight stay at a lodge. Rest Day in Manang. We do an acclimatisation walk, where you can be blessed by a Lama before going over the Thorung La Pass. Manang to Churiledar 4,200m/ 13,780ft – Hiking time: 4 to 5 hours. 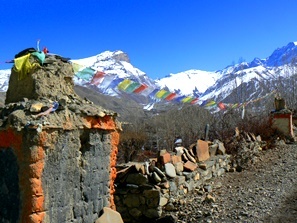 The trail climbs steadily through Tengi Manang, leaving the valley behind and carrying on north, following the Jarsang river. We walk through a valley with snowy peaks rising on both sides. Himalayan blue sheep may be spotted here. Overnight stay at a lodge. Phedi to Mukinath 3,800m/ 12,467 feet crossing Thorong Pass 5,420m/ 17,782 feet – Hiking distance: 9 to 10 hours. You will start the trek early at approximately 4:00am. The trail climbs steeply but is regularly used and easy to follow. The views of the peaks will leave you breathless. After reaching the highest point of the Thorung La, you will have a tough descent 1,600m/ 5,249 feet to Muktinath. 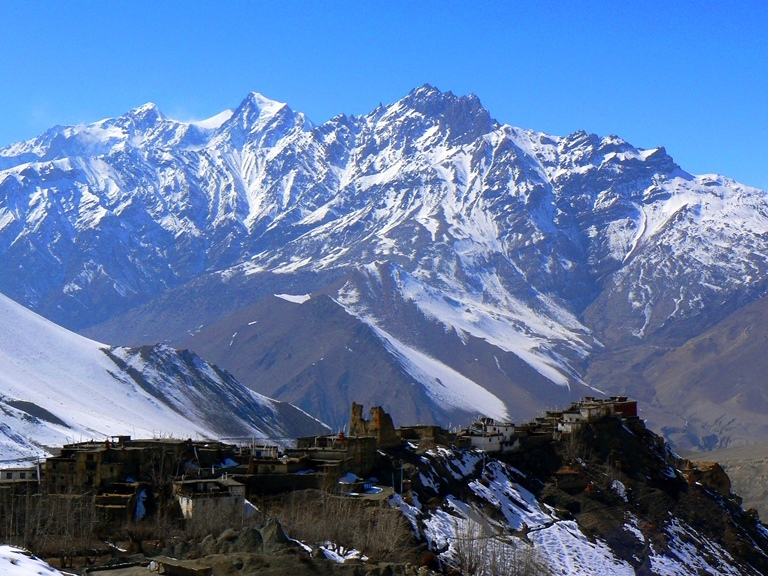 Muktinath is a village of great religious significance. It is a pilgrimage center for both Buddhists and Hindus. You will also come across Tibetan traders and Sadhus (Holy men). Overnight stay at a lodge. Muktinath to Kagbeni 2,800m/ 9,186 feet – Hiking time: 2 to 3 hours. You visit the Temple of Muktinath, Buddhist Monastery and the famous natural gas light which is known as the flame of Muktinath. There are fine views of Nilgiri and Daulagiri mountains as well and after lunch we trek to Kagbeni. The hike is downhill and pleasant, passing Tibetan-style villages until you reach Kagbeni. You will now be in the Lower Mustang district. You can explore around the Monastery and village. The people are very friendly, giving the place a pleasant energy. Overnight stay at a lodge. Kagbeni to Marpha 2,690m/ 8,825 feet – Drive by Bus or private Jeep. From Kagbeni, you will walk along the left side of the Kaligandaki River. Keep your eyes open for fossil stones. 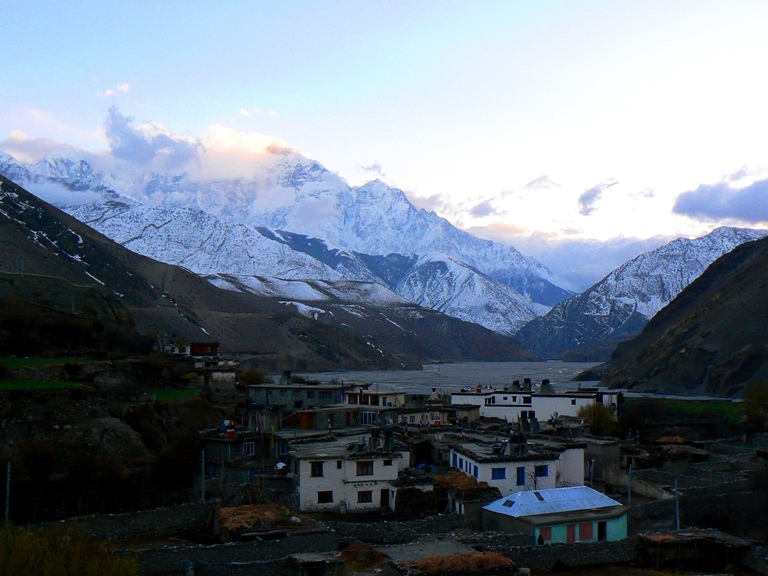 The trek continues through the Mustang district to Jomsom town. You can stop to visit the Mustang eco-museum to see the display of cultural and geographic information of the area. The museum also has an herbal plant collection. From Jomsom, it is a flat and greener walk to Marpha. It is one of the largest villages of the area and home to the Thakali people. Made up of white painted houses, clean streets and orchards, gives the village brightness. Try the delicious locally produced Brandy. Overnight stay at a lodge. Marpha to Tatopani 2,010m/ 6,594 feet by Bus or Private Jeep – Driving time 4 to 5 hours. Today we drive from Marpha to Tatopani passing through Dana (worlds deepest Gorge). Tatopani is enjoyable for the food and natural Hot Springs. The town is usually busy with resting trekkers. You can relax all of your well worked muscles in a hot natural bath while having a drink from the bar facility. There are many lodges to choose from and plenty of shops around. Enjoy the fresh seasonal fruit that grows locally. Overnight stay at a lodge. 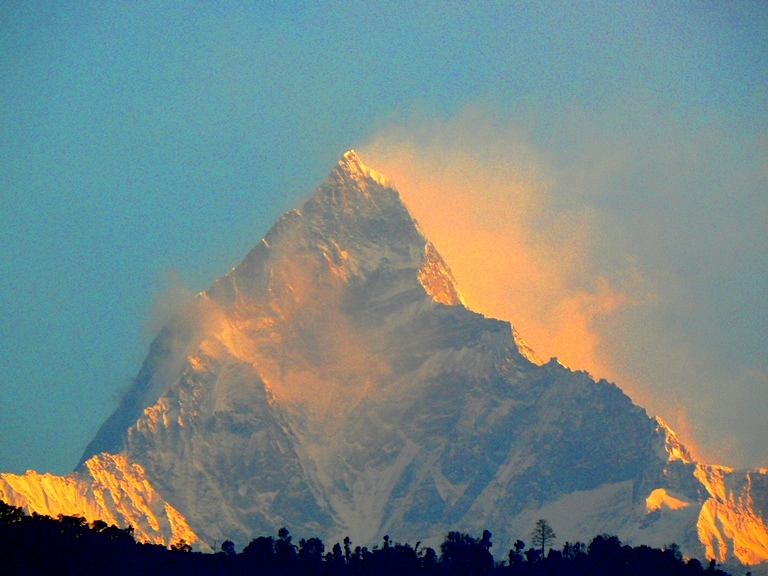 Tatopani to Pokhara 820m/ 2,690 feet by bus or jeep 8 to 9 hours. The trail leads along the Kaligandaki riverside. You may want to bring some snacks or a packed lunch, as there aren’t many restaurants on the way. You may want to stop in Galeshur for lunch, but you can also walk further onto the headquarter district of Beni and then drive to Pokhara. It is popular for its ambient lakeside and fine views of the Annapurnas. 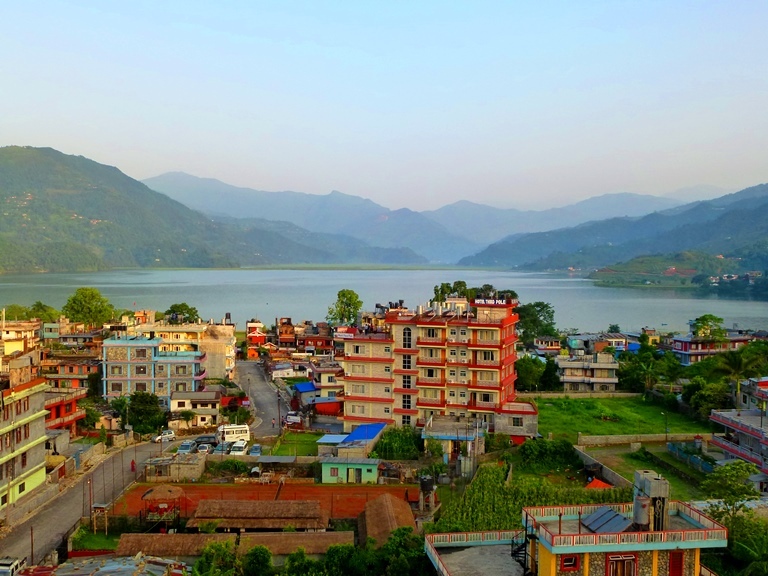 You will have some time to enjoy the Pokhara in the morning and then fly back to Kathmandu from Pokhara, your Annapurna Circuit Trek is over. We will have a team dinner and present certificates. Overnight in hotel in the Thamel district. You can relax in Kathmandu during the day and we will transfer you back to the airport for your international flight home. Does this information excite you to take the next step towards achieving your goals of completing the Annapurna Circuit Trek ? If so, get in touch today. We pride ourselves on making sure that our clients have every opportunity to succeed on the mountains, including professional training advice, gear lists and video links on how to pack your bag, and much more. We are always available to answer any questions you may have by email, phone or skype, so contact us today!